Recently some designers from Chicago asked me to provide artwork for 6 very large back-lit panels in a Radiology suite. The unusual thing about the project was that the images will be seamless and elliptical rather than small rectangular ceiling grids. The fabricator is NewMat Stretch Systems. I learned from their website that they use a flexible PVC material, custom cut and surrounded by a welded, semi-rigid “harpoon”. HD: One of the things that I found most interesting about Newmat is that it can cover large ceiling areas without having any seams. How do you avoid sagging of the PVC membrane? PG: While we can achieve ceilings up to 1,000/1,200 sq. feet in one monolithic membrane, this does not mean that there are no seams in the material. The material will have welded seams which are very discrete and non-structural. The ceiling being under tension it is pretty flat but on very large ceilings, there will be a small to medium amount of sagging. Depending on the height of the ceiling, the sagging may or may not be noticeable. HD: You offer a transparent version of Newmat called NewLight. How is this different from your other offering? Is NewLight the only product you offer that can be backlit? PG: The NewLight is the only ceiling line that can be backlit and this is how it differs from the other lines. HD: How large can the translucent NewLight be without having seams? PG: If you do not want welded seams, the maximum size of a NewLight without seams is 7’ wide by however long you want it to be. HD: Can photographs be printed on all Newmat products? 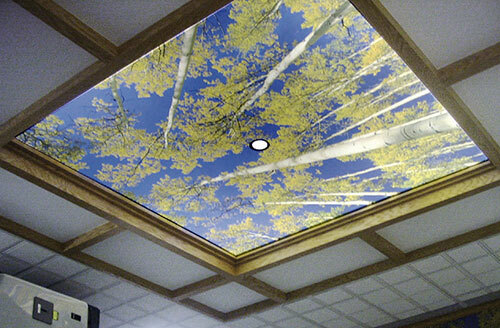 HD: Typical Lightbox panels used in ceilings are 2×2 or 2×4-feet in size. Besides the fact that the Newmat membrane can be much larger, what else differentiates you from your competition? PG: We do not compete with standard 2’x2 or 2’x4’ fixtures. We are mostly used for much larger installations and much larger openings. However, we provide lenses 2’x2’, 2’x4’, 4’x4’, 5’x5’, 6’x6’, etc, to a company called Mark Architectural Lighting for their veil series. HD: Can your clients use local contractors to do installations? PG: Only if the local contractor is the Newmat licensed installer for that area. HD: When I provided some digital photographs for a Newmat project recently, I was told that the printing will be done in France. Is that right? HD: I was also told that once it is printed that it has to be heated. Does that occur at the installation site? Beautiful material, and great use of your photograph. I love all of the new opportunities that are becoming available. We produce and install stretch ceilings too and our prices are MUCH lower than Barrisol or Newmat. I heard the is US stretch ceiling manufacturer. Does any one knows were ? I’m tired with shipping and customs fees.Waiting time – 2 -3 weeks. We want made in USA ! Gorgeous job! I’m curious if photographic ceilings can be damaged by the heat or different temperatures? Jacob, thanks for the kind words. 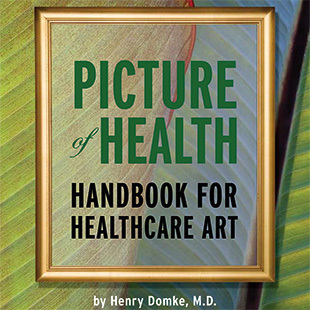 Based on my understanding most hospital settings are using lower-temp LED bulbs which should have less impact on the artwork. I would defer to the manufacturer of the photographic ceilings for specifics. Let me know what you find out.